Home > News > Careers > Clock this! 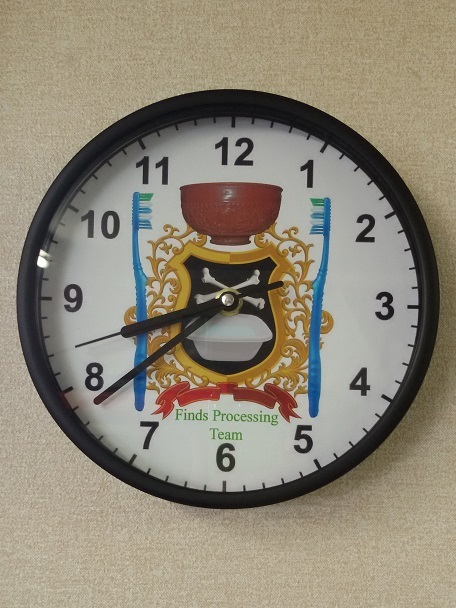 Made from high quality plastic the clock is embellished with the newly designed coat of arms for the ‘Ancient Order of Finds Processors’. Taking centre stage is the all-important basin of water, flanked by two toothbrushes always at the ready. Crossed bones and a samian pot are the crowning glory. Thank you Shaun. Ticks all the right boxes!